Another year on the market, 2014 marks the 80th anniversary of the Chevy Suburban. An extended version of the Tahoe, the Suburban comes with a spacious interior, towing capabilities, phenomenal performance and the all-new Standard Convenience Package. Rugged and capped off with the signature Chevy bowtie, the Suburban's exterior keeps with tradition and displays a twin-port horizontal grille, bold fog lamps and headlamps, recovery hooks, a skid plate, front license plate holder and standard 17-inch wheels. For a dash of luxury, upgrade options are available including, power-retractable steps on LTZ, heated power-operated side mirrors on LT (standard on LTZ), a power-operated liftgate (available on LT; standard on LTZ) and 20-inch wheels on LS and LT (standard on LTZ). Three rows of seating, with a removable third bench, maintain the Suburban's reputation as a roomy family vehicle. For the second row, Springfield shoppers have the option of a bench seat or two bucket seats to complete the nine-passenger seating arrangement. A 130-inch wheelbase increases the vehicle's cargo space to 137.4 cubic feet, while an AM/FM/CD audio system, multiple cup holders and a large center console bin round out the interior. New for 2014, The Convenience Package comes standard on LS with power-adjustable pedals, rear park assist, a rear vision camera, inside mirror with camera display and a remote vehicle starter. 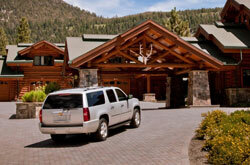 A Luxury Package for LT and the Sun, Entertainment and Destinations Packages for LT and LTZ are also available. A 5.3L V-8 engine in conjunction with a six-speed automatic transmission give the SUV enough power to tow up to 8,100 pounds. 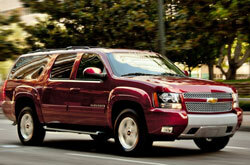 Reviews for the 2014 Chevy Suburban emphasize this feature for its ability to take on a variety of cargo. The latest edition comes in four-wheel or two-wheel drive. 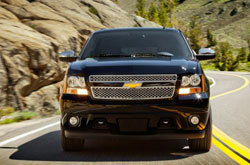 Learn more about the 2014 Chevy Suburban in Springfield below. We challenge you to compare the newest Suburban model alongside segment competitors like the 2014 Buick Enclave, Nissan Armada, Ford Expedition EL, Toyota Sequoia and the Dodge Durango. That's how confident we are that it's ideally suited for you. The Suburban's pronounced looks, state-of-the-art incar technologies and affordable price are sure to win over MO shoppers. You'll easily see it's a truly outstanding value when you compare its price to competing vehicles. For more information, check out the Suburban's quick-facts list below. The 2014 Chevrolet Suburban review above was penned by Reliable Chevrolet's expert writers; for information about older models please view the links in the sidebar. Not all Springfield car franchises are alike. We differ from others in that we feel it's our obligation to outfit customers with quality reviews. Make intelligent decisions when it comes to your next auto purchase - don't take guesses! Each paragraph is brimming with data and vehicle features in a clear format that's easy to understand. Now that you've gone over Reliable Chevrolet's Suburban review, please reach out to us to schedule a test drive or learn about great lease offers and national incentives.